Esther Middlebrook married Edward Wigglesworth on 27 October 1629 in Lincolnshire. [S158] W.H. Whitmore, Payne and Gore Families, p.12. [S158] W.H. Whitmore, Payne and Gore Families, p. 13. Children of Jane Middlecott and Elisha Cooke Jr.
[S125] Robert Moody & Vincent, Verle Delano Sherman, Mayflower Families, p. 49. [S41] Leverett Saltonstall, Ancestry and Descendants of Sir Richard Saltonstall., p. 157. [S102] Annie Haven Thwing, Inhabitants of the Town of Boston, 48295. [S46] Various contributors, Daughters of the American Revolution, Vol. 13 p. 226. [S150] Unknown author, Historical Encyclopedia of Illinois & History of Morgan County, p. 939. [S392] Website findagrave.com (http://www.findagrave.com/) "# 59113644." [S112] Unknown author, Sewall. 1908, p. 4. [S34] Unverified internet information, A sermon delivered December 31st, 1794: at the funeral of Mrs. Mehitable Dutch, wife of the Rev. Ebenezer Dutch, A.M. Minister in Bradford. FARMINGTON -- Barbara Mildram Thompson died on Friday, Feb. 21, 2014, in Farmington. Barbara was born in Newton, Mass., on Nov. 28, 1915, the daughter of Frank and Louise Mildram. She graduated from Newton High School and then Vassar College. Barbara enjoyed a long and devoted career in Early Childhood Education as a teacher, administrator, and college professor starting in New Mexico, then Washington, D.C., New York City, New York state, and eventually Providence College. From 1960-1968, Barbara worked with nursery schools, kindergartens, and day care centers to help oversee the first years of Head Start in New York state. She was an athlete, and was an early advocate for women's sports, including lacrosse. She was proud to have competed on a women's American field hockey team for a tour oversees. She was a President of the Boston Field Hockey Association. Barbara loved traveling the world and taking lots of pictures. She was up for adventure throughout her whole life. At retirement, she came to Maine, the birthplace of her ancestors. 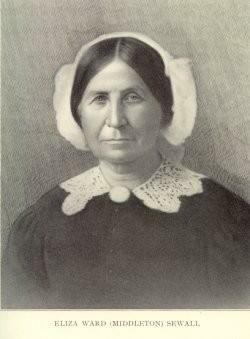 Living in Falmouth, she worked diligently on documenting the Mildram, Sewall and Weston genealogies. This included traveling to dozens of New England cemeteries and gathering records from town halls. This 300 page document was reproduced and proudly given to family members and genealogical societies in Maine. Barbara was independent, with many friends. This changed when she was bitten by love, and married for the first time at the age of 87, to the Rev. William Thompson, also of Falmouth. His family lovingly embraced her. For over 20 years, she faithfully volunteered weekly at the Maine Historical Society until she was about 90. She read one or two newspapers a day. Among the scores of people whose lives she touched, Barbara is survived by Cynthia Mildram Foster of Maine, Janice Mildram of Maine, Douglas S. Mildram of Massachusetts, Stephen Mildram Holton of Connecticut, David K. Holton of Colorado, Doug and Gail Thompson of Portland, and all their families. [S589] Barbara Mildram, Mildram - Sewall, p. 17. [S205] Newspaper, Portland Press Herald, 2 March 2014. Frank Clement Mildram was born on 13 March 1881 in Wells, Maine.1 He was the son of Clement Laurens Mildram and Georgianna Anne Hobbs.1 Frank Clement Mildram married Louise Weston Sewall, daughter of Eugene Dana Sewall and Fannie Dinsmore Weston, on 20 October 1909 in Livermore Falls, Maine.1 Frank Clement Mildram died on 2 December 1962 in Newton, Massachusetts, at the age of 81. [S83] NEHGR, Vol. 108 p. 40. [S102] Annie Haven Thwing, Inhabitants of the Town of Boston, 16150. [S89] Family Search, England Births and Christenings, 1538-1975 for Emily Millais. [S392] Website findagrave.com (http://www.findagrave.com/) "# 32230817."